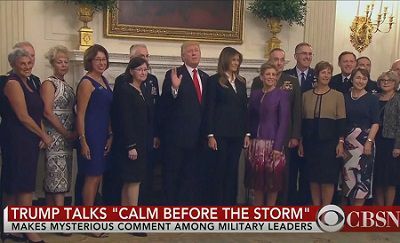 The trump's confusing comment "calm before the storm"
President Trump offered some confusing comments in front of reporters Thursday night, when at an event for military officials and their spouses he suggested the moment represented "the calm before the storm."Mr. Trump and First Lady Melania Trump, flanked by military spouses for a photo op at the White House, said, "You guys know what this represents? Maybe it's the calm before the storm," the president said.Pressed on what he meant, Mr. Trump said "we have the world's great military people" in the room.Asked yet again for an answer, Mr. Trump said "you'll find out. "The president then bid everyone a good night, without clarifying his comments.